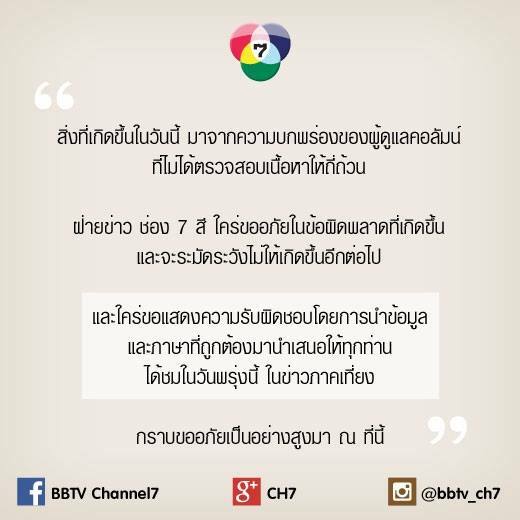 The executive board of the famous Thai television station Channel 7 yesterday apologised to the Lao people in regards to its insulting interpretations of the Lao language, according to the Lao Foreign Ministry. The programme concerned was broadcast on Thursday afternoon, as part of a series on Asean. In this instance the hosts compared the meanings of Lao and Thai phrases and their differences that saw inaccurate interpretation from Thai phrases into Lao. The Lao and Thai languages are similar, and the people of the two countries understand each other although they speak their own languages, which contain many differences. While it is likely that the Thai programme compared the meanings with the aim of entertaining their audience, many people in Laos considered it as insulting. The issue triggered offence among many Lao nationals, with a number of Lao people venting their anger over the issue through social media condemning the insulting interpretations. As one example, they compared the Thai word for train, “lot fay,” which they interpreted in Lao as moving a budget flat or row room, but this is patently incorrect. In fact, this particular phrase is identical in Lao and Thai. A Lao Facebook user nicknamed Bob produced several cartoon clips with his well-known cat cartoon targeting the Channel 7 programme, launching emotionally strong words in return. The clip got thousands of like within a day. The user said “May I extend the clip to the Channel 7,’ likening the extension as extending merit to dead people. Following the angry outburst by thousands of Lao people, representatives of the Channel 7 executive board went to the Lao Embassy in Bangkok yesterday to extend their apologies and accept responsibility. The editors in charge of the programme had an excuse for the content, saying that they failed to make a proper check before broadcasting and thereby triggering the offence, according to Thai media. The station’s board promised the Lao ambassador to Thailand Mr Lee Bounkham that they will exercise more caution so as not to repeat the mistake in the future, the Lao foreign ministry said in its press release. Mr Lee called for increasing vigilance and proper checking of the information before broadcasting, while strictly exercising professional ethics in order to promote harmonious relations between the people of Laos and Thailand. ????????????????? ???? 7 ?????????????????????????????????-??? ?????? ???????????????? 24 ?????? 2014 ?? ?, ????????????????????????????????????? ? ? ? ??? ??????????????????? ?????????? ; ???? ??????? ????????????????? ?, ?????????????????????????????????? ?, ??????????????????????????????????????????? 7 ?????? ???????????????????????????? ??? ??????? ?, ???????????????????????? ??? ??? ????????????????????? ????????????????????? ?, ????????????????? ?, ??????? ???? ??????????????????????????????????????????? “?????? ??? ?” ?????????????????????? 7 ??????? 23 ?????? 2014 ??????????????????????????????????? ??????????????????????????????????? ?, ????????????? ???? ???????????????? ??? ??????? ???????????????????? ?????????????????? ??????????????????????????? ????????????????????????????????????????????????????????????-? ?, ????????????????????????????? ????????? ?????? ????????????????????? ?????????????????????????????. ?????????????????? ?, ?????? “?????? ??? ?” ??????? 7 ???????????????? ???????????????????? ?, ?????????????????????? ??? ??????? ?????????????????????????????????? ?